Model of the passenger vessel being built by Valmet for Birka Line. Birka board chairman Bjorn Erik- son inspected the first keel block before hull assembly was started. 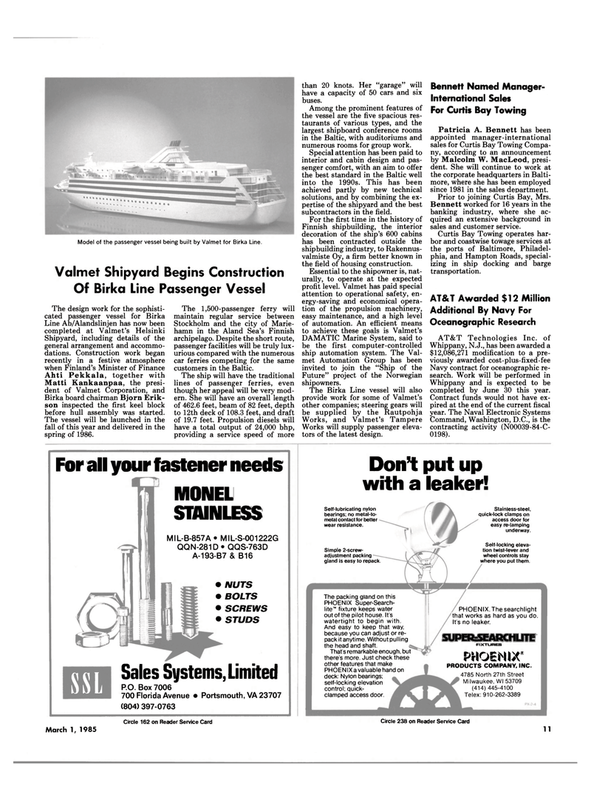 The vessel will be launched in the fall of this year and delivered in the spring of 1986. Stockholm and the city of Marie- hamn in the Aland Sea's Finnish archipelago. Despite the short route, passenger facilities will be truly lux- urious compared with the numerous car ferries competing for the same customers in the Baltic. The ship will have the traditional lines of passenger ferries, even though her appeal will be very mod- ern. She will have an overall length of 462.6 feet, beam of 82 feet, depth to 12th deck of 108.3 feet, and draft of 19.7 feet. Propulsion diesels will have a total output of 24,000 bhp, providing a service speed of more than 20 knots. Her "garage" will have a capacity of 50 cars and six buses. Among the prominent features of the vessel are the five spacious res- taurants of various types, and the largest shipboard conference rooms in the Baltic, with auditoriums and numerous rooms for group work. Special attention has been paid to interior and cabin design and pas- senger comfort, with an aim to offer the best standard in the Baltic well into the 1990s. This has been achieved partly by new technical solutions, and by combining the ex- pertise of the shipyard and the best subcontractors in the field. Finnish shipbuilding, the interior decoration of the ship's 600 cabins has been contracted outside the shipbuilding industry, to Rakennus- valmiste Oy, a firm better known in the field of housing construction. Future" project of the Norwegian shipowners. Works will supply passenger eleva- tors of the latest design. Patricia A. Bennett has been appointed manager-international sales for Curtis Bay Towing Compa- ny, according to an announcement by Malcolm W. MacLeod, presi- dent. She will continue to work at the corporate headquarters in Balti- more, where she has been employed since 1981 in the sales department. Prior to joining Curtis Bay, Mrs.
Bennett worked for 16 years in the banking industry, where she ac- quired an extensive background in sales and customer service. Curtis Bay Towing operates har- bor and coastwise towage services at the ports of Baltimore, Philadel- phia, and Hampton Roads, special- izing in ship docking and barge transportation. Whippany and is expected to be completed by June 30 this year. Command, Washington, D.C., is the contracting activity (N00039-84-C- 0198). Dont put up with a leaker! Self-lubricating nylon bearings; no metal-to- metal contact for better wear resistance. Simple 2-screw- adjustment packing gland is easy to repack. PHOENIX Super-Search- lite™ fixture keeps water out of the pilot house. It's watertight to begin with. And easy to keep that way, because you can adjust or re- pack it anytime. Without pulling the head and shaft. PHOENIX a valuable hand on deck: Nylon bearings; self-locking elevation control; quick- clamped access door. Stainless-steel, quick-lock clamps on access door for easy re-lamping underway. Self-locking eleva- tion twist-lever and wheel controls stay where you put them. PHOENIX. The searchlight that works as hard as you do.